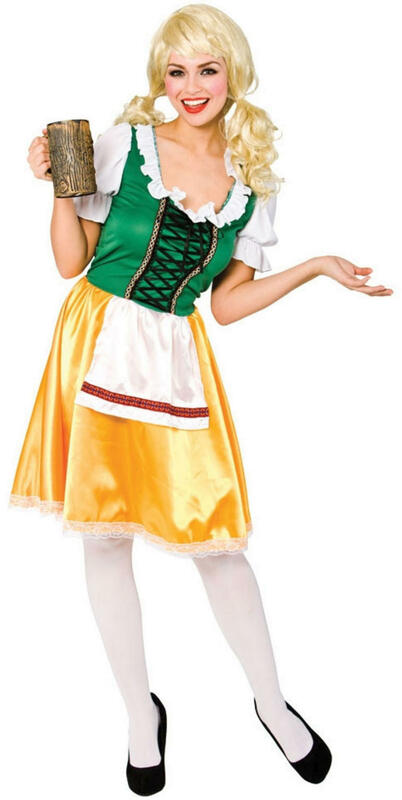 Our fantastic ladies Bavarian Beer Girl costume is the perfect outfit idea for anyone who is going to this years big beer festival, Oktoberfest. Included is a cute German style dress, the upper comprises of a green bodice decorated with intricate lace detailing framed with a gold braided trim alongside a white frill trim to the hemline and a pair of elasticated white puff ball sleeves, the lower comprises of an eye catching yellow skirt decorated with a floral lace trim and an attached white apron. Ideal for Oktoberfest celebrations or for a National Dress themed fancy dress party.